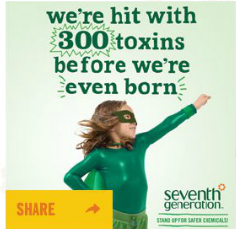 I've recently teamed up with Seventh Generation to help spread awareness about how important chemical reform is in the US. The reason that this is important to me is because I have been trying to switch to less harmful and strong chemicals for cleaning. I am pregnant with my first child and know that I am not supposed to be exposed to strong chemicals so I am trying to switch to healthier options. In the future, I hope for chemicals to continue to be made more environmentally friendly so that we have a safe environment to live in. -More than 80,000 of the chemicals used here in the US have never been fully tested for their dangerous effects on our health and the environment. -Using toxic chemicals has been linked to an increased risk of Cancer, Alzheimer’s, learning disabilities, asthma, birth defects, and various reproductive problems. -The Toxic Substances Control Act was passed in 1976 and never updated. Therefore, many harmful chemicals continue to be used without being properly tested. After reading these facts, I find them to be pretty darn scary. I think that it is the unknown amount of harm being caused is what is the worst. In my life, to be more environmentally friendly and to reduce my family's exposure to toxins, I aim to do more green cleaning. I have read about using white vinegar to clean many things and would like to try it out. Also, I have switched to more environmentally friendly products such as Seventh Generation which is not toxic. The health and safety of my family are very important to me.